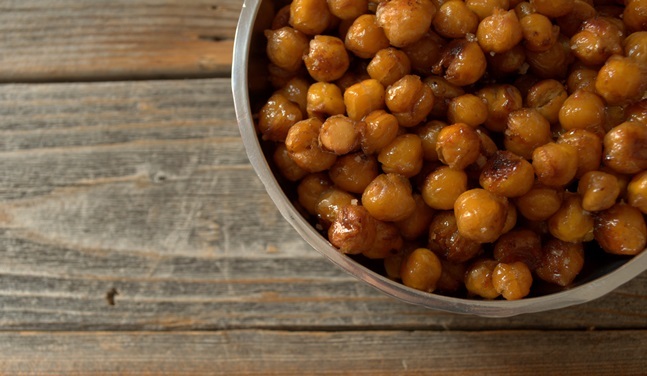 Roasted ceci (pronounced chae chee) – or chickpeas, garbanzo beans, chana, hummus, sanagalu – are one of our favorite snacks. They’re full of nutrition and are truly a traditional food. Ceci remains were found in the Middle East (or Southwest Asia for you geography buffs) dating back more than 7,500 years, and it’s no wonder why they’re still around today. Full of soluble and insoluble fiber that assist in detoxification and feed the bacterial colonies in our colons, packed with protein (for a non-animal food), and high in micronutrients such as folate, manganese, and iron, these little legumes should be more than a one-liner at a potluck table in the form of hummus or a 3-bean salad. As always, I recommend soaking and sprouting all seeds, including legumes, before consuming to reduce the amount of anti-nutrients present (read more). Use sprouted and cooked beans for this recipe or canned in a pinch. Add chickpeas to oven-safe dish approximately 13x9x2 inches in size. Mix remaining ingredients in small saucepan and stir over low heat until coconut oil and ghee have melted. This will ensure even coverage and allow spices to infuse into liquids. Pour mixture over chickpeas and stir until thoroughly coated. Bake at 400 for 30 minutes, stir after 20 minutes to ensure even browning and to recoat with spice mixture. Raise temperature to 425 degrees F and roast until brown, stirring every 10 minutes until desired texture is reached. We like them crunchy, so I will sometimes leave them in the oven for up to an hour depending on how long it takes them to lose the excess moisture. Mmmm, this recipe looks delicious! Will have to try it. I’m always craving salty snacks. These look like they would be perfectly sweet and salty. I’ll be trying these soon! Do you think this would work with bacon fat? Sounds silly, but how long do you sprout and then cook chick peas? I’ve always used canned but I want to start using dried. That’s why there is a note that you can substitute allergy-free fat substitutes. 🙂 Many people who have a dairy allergy still use ghee and there is always an allergy to something (like coconut oil), so I made sure to give options. I only use coconut oil when making it for my daughter and I but use ghee for my husband.